Writing to Mrs. Riley of 23 Rifle Street, Haslingden, an officer states that her brother, Pte. James William Nuttall, East Lancashire Regiment, was killed in action on September 9th, 1917, and some of his chums have also written to the effect that he had been buried behind the firing line. The deceased, who resided with his sister, was 24 years of age, single, and an overlooker at a Blackburn Mill. 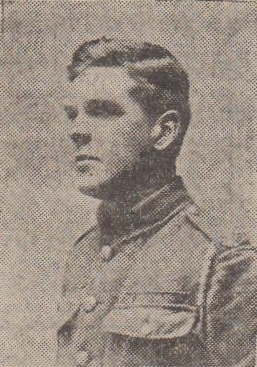 He enlisted in February, 1915 and went to the front in September 1916. Two months later he was invalided home with rheumatism, but returned to the front in Easter of the present year. On Haslingden Ebenezer Church roll of honour, a service in memory of him was held at that place of worship on Sunday morning. His cousin, Private Arthur Pickup of Haslingden, fell in the same company as the deceased last May. In loving memory of Private James W. Nuttall, East Lancashire's, who made the great sacrifice September 9th, 1917, aged 24 years. For we who loved him well." From his loving Sister, Mrs. Riley, Clara and Nellie, 107 Bury Road, Haslingden. When we think of the days that once had been." Sadly missed by Grace, 7 Belgrave Street, Rising Bridge. But safe in God's keeping now you lie. Who have paid the supremo sacrifice." From his loving Sister, Nancy Jane, and Brother in Law, Jack, Ruth and Fred, 170, Bury Road, Haslingden. Our tears start fresh when we think of you." From Annie and Edward, and little Alva, 102 Manchester Road, Haslingden.